Located underneath the Grand Boulevard Bridge, Garden Under the Bridge is an integrated sculptural environment that creates a bright, welcoming and safe atmosphere for Metro riders. 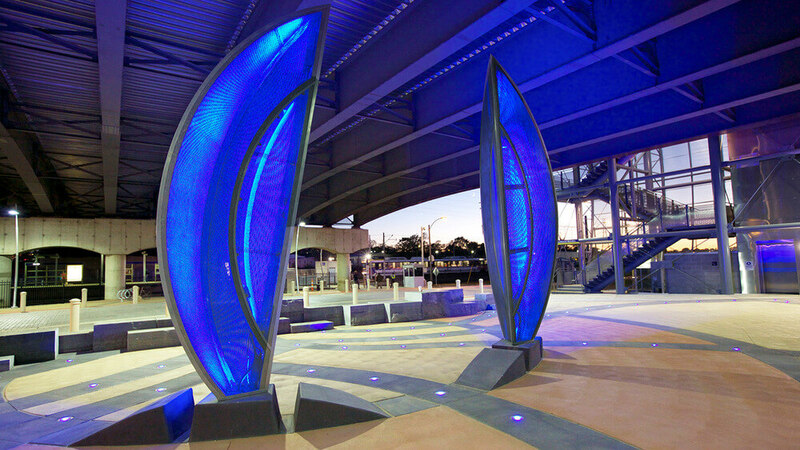 In the center of the transit plaza, two glowing, ‘seed pod’ forms create a gateway to the station and illuminate the surrounding area with electric-blue light. LED lighting embedded in the organic paving design work in concert with this main sculpture, glowing at night to become the ‘night blooming flowers’ of this garden of concrete, steel and light. Commissioned by AIT for Metro St. Louis with funding from the Federal Transit Administration (FTA).